I’ve spent most of the past month travelling around Germany and Austria teaching. It’s for an extra-curricular school programme. You do activities to boost the children’s speaking confidence in English, work on creative projects, and put on a show for the parents with presentations of the projects, and drama written by the students. You don’t need to speak German to do the job, and you never speak German in the classroom, but of course it comes in useful to understand if the kids are being naughty, and in your time outside the classroom. The company arrange your flight out, and book hotels for you in the towns you’ll be working in, and give you a travel budget but it’s up to you to get yourself between the places in a timely manner (and to get to the right obscure town in Austria in the first place). This time all my assignments were roughly an 8 hour train ride from each other, so I’ve become very familiar with the different categories of intercity train in this part of the world. I finished work this weekend, and now I have a few days free in Nuremberg before I fly back to the UK, and start another job hunt in earnest. It worked out the same cost to fly back midweek and stay a few nights than it did to fly at the weekend. Silly, really. I am a little bit exhausted. This is the first day I haven’t either taught for 6 hours, or spent 4 hours + on a train. Berlin: Company flew the teachers for Brandenburg and Saxony there. (Never ending) Train to Dresden. Dresden: A week working in a secondary school in a suburb of the city. I saw as much as I could of the city, and visited a very interesting museum about daily life under the former communist regime. Prague: A day trip and overnight stay with another teacher. 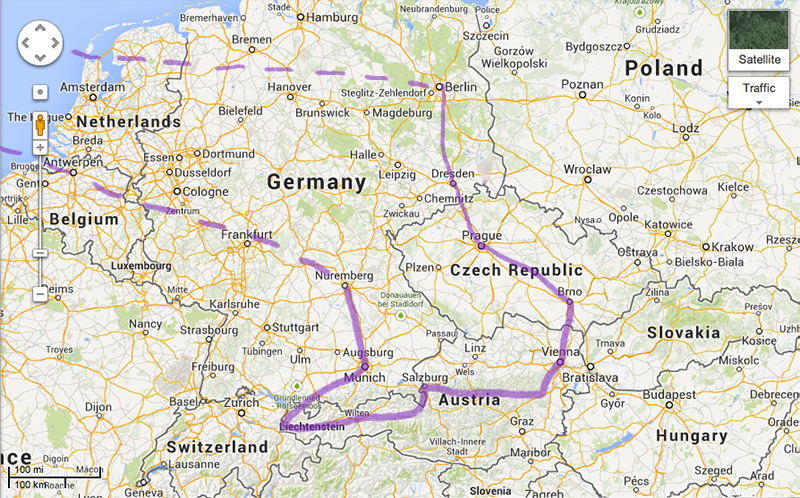 We both had to go to Lower Austria on Sunday evening, and you could either go via Prague or Munich. Kirchberg-am-Wechsel: A week in a junior school in a really tiny mountain town to the south of Wiener Neustadt, right at the end of the Alps. Salzburg: My next assignment was on the Austrian/Liechtenstein/Swiss border, so I had a long train journey through the alps via Salzburg and Innsbruck. I broke the journey to stay overnight at Salzburg and do a litle sightseeing by myself. Liechtenstein: I saw 66% of the museums, and all the major towns. There are few countries where you can do that in one afternoon. Nuremberg: The cheapest place in the region that I could find a flight back to the UK from. Originally the plan was that I was going to meet my friend Ellina this weekend, but we couldn’t find anywhere that would be a cheap flight for her from London on Fri/Sat and a realistic train ride for me. Getting to Nuremberg was still an all day affair that involved changing at Innsbruck and Munich. Mountains get in the way a lot. I return to the UK early on Thursday morning. I took a lot of photos, and have quite a bit to say about the places I visited, which will appear here in the next few days.